Here’s another example of enterprises extracting value from otherwise dormant data. This time, Hadoop-based Hortonworks software is in the spotlight. Luminar, a unit of Entravision Communications Corporation, is a data analytics and modeling pioneer. The only data analytics company with an exclusively U.S. Latino customer base, Luminar uses proprietary technology to transform consumer data into insights and business intelligence. Luminar suffered from a unique business problem—sub-par data processing caused by its success. Like most companies, Luminar made business decisions based on structured data from many (in this case 300) sources. But as the company grew, it pulled in more and more diverse information. Often, this included massive amounts of data in less structured formats. Company software couldn’t analyze all the data and assign it to columns and rows with pre-defined attributes. The problem: any solution that could meet Luminar standards of customer service and customer expectations had to meet a stiff list of functional requirements. To meet these standards, Luminar worked with Hortonworks consultants to build and deploy a truly modern analytics infrastructure. Build models based on empirical evidence (not a sample) of nearly 15 million adult U.S. Latinos. Get answers based on as many transactions and data sources as possible. Build a storage platform that could scale up as company analytics grew in size and complexity. Convince clients that Luminar marketers could use many types of data and generate reports quickly and efficiently. Hortonworks Data Platform: store and process the data. Lower barrier to entry (quick affordable development and deployment) enabled quicker time to market and value. Interoperability with other pieces of their storage and business intelligence framework reduced capital costs. Data capture increased seven-fold (data sources increased from 300 to approximately 2,000). Processing time decreased from hours to minutes per query. After the Hortonworks installation, system performance improved dramatically. Luminar constantly updates its analysis with new transactional data. Before the Hadoop deployment, it could take Luminar several days to ingest and join data to refresh one of their models. Now it takes only hours. Now, that the Luminar IT staff can employ Big Data analytics in parallel, the company can make richer, more accurate predictions than previously. And, they can engage in more projects and process more data every month, without analytics bottleneck. The results: potentially higher revenue and more happy customers. 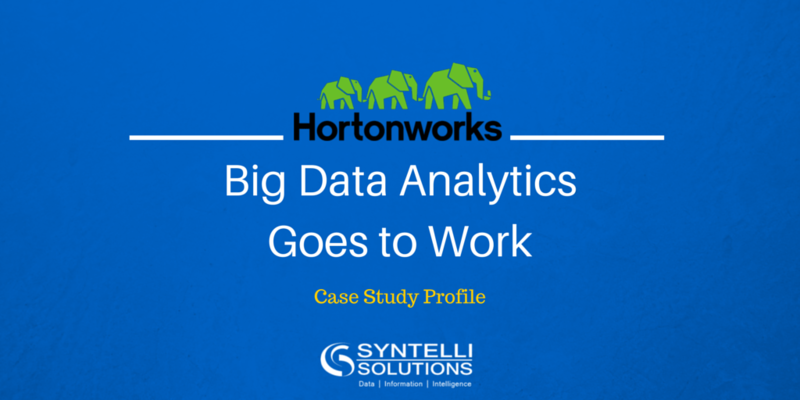 You can find more details about this case at http://hortonworks.com/customer/luminar-insights/. To learn more about Syntelli’s Big Data solutions, contact us today, or request a demo of Syntelli Services!